Tri Star Sports and Entertainment Group will soon relocate to 11 Music Circle S. Tri Star closed on the property that was previously owned by businessman and real estate investor Ted Welch on May 31. The company’s current offices are located at 1222 16th Ave. S. Tri Star Sports and Entertainment’s client list includes Mat Kearney, RedFoo, Nicole Scherzinger, Casey James, Delta Goodrem, Jack Huston, Steel Magnolia, Kenny Britt, Gabriel Douglas, Tate Stevens, Niki Taylor, Britney Spears, Jamie Lynn Spears, Les and Kara Snead, Jeff Fisher and many more. “We are so excited to be closer our fellow entertainment community colleagues and look forward to moving into our new building and continuing to deliver the same outstanding services,” said Lou Taylor, CEO of Tri Star Sports and Entertainment Group. 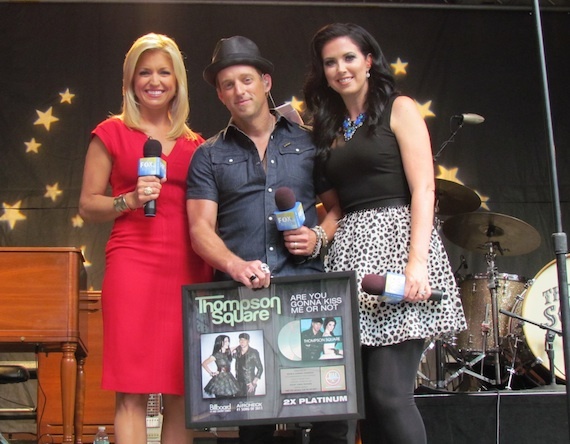 Thompson Square was surprised during their recent appearance on the FOX & Friends All American Summer Concert Series with a double platinum plaque commemorating two million in sales for their chart-topping smash, “Are You Gonna Kiss Me Or Not.” FOX & Friends host Ainsley Earhardt presented the duo with the hardware on stage at the FOX News Channel Plaza in front of hundreds of fans who had braved the early morning hours to enjoy the free concert from the two, who are currently touring with Luke Bryan through October. 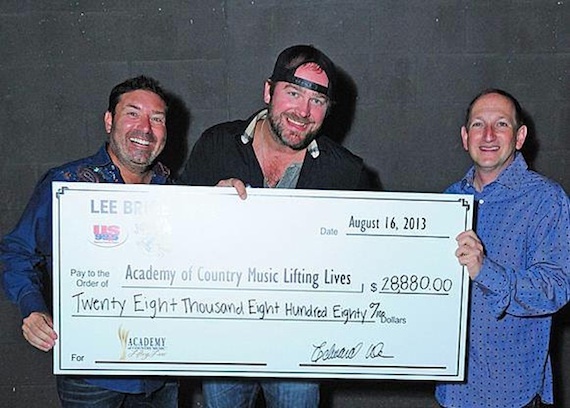 A portion of the proceeds from Lee Brice’s headlining show at Chicago’s Joe’s Bar on Aug. 16 benefited the Academy of Country Music‘s Lifting Lives charity. The show raised more than $28,000 for the cause – a record amount for the concert series — which will go to help fund organizations that are improving lives through the power of music. This is the third Joe’s Bar performance that has supported Lifting Lives; the first, in 2011, featured LeAnn Rimes and Crystal Bowersox, and the second, in 2012, was headlined by Gary Allan. Pictured (L-R): Tommy Disanto, Joe’s Bar Co-Owner; Lee Brice; Ed Warm, Joe’s Bar Co-Owner and ACM Lifting Lives and ACM Board Member). 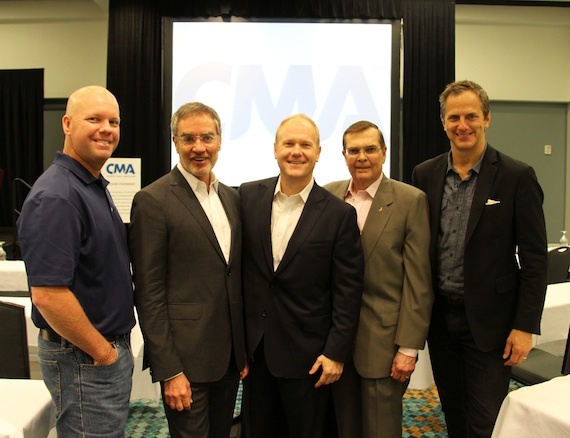 Clear Channel Chairman/CEO Bob Pittman kicked off the Country Music Association’s quarterly meeting Wednesday, Aug. 21, with a speech at the opening session. Several Clear Channel execs were in the attendance during the address.